Photo courtesy of Stephanie Stein. tall as the photo shows and very thick. 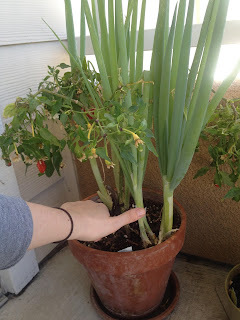 A while ago, I wrote a post about our patio garden. In that post, I shared one of my biggest learnings: a successful small container garden is like an ecosystem. Many edible plants do best when they have flowers and other plants supporting them, acting as repellants for undesirable bugs and as attractions for good critters. While pest control is certainly one important aspect of the ecosystem, I have since learned that plants can be compatible for a host of reasons. A friend tipped me off that she planted her green onion and chili pepper plants together in the same pot, because she had read they support one another. The peppers had a good yield, and the onions got huge! I started reading more about it and learned that this is called “companion planting.” Companion plants may help each other by producing higher yields, better flavor, disease resistance, and/or pest control. Conversely, some plants may actually stunt growth when planted together. For example, while garlic and onions may work great with pepper plants, they are known to stunt the growth of beans and peas. Tomatoes and potatoes are also not a good match, as they can be negatively affected by the same blight and may spread this to each other. Corn, mature dill, and kohirabi are also poor companions for tomatoes. Seasoned gardeners have compiled extensive lists of plants that make great companions and sorry enemies. To read more about the relationships between specific plants that interest you (and to find companion planting charts), see here and here. As we start our next garden, I hope to put this companion planting knowledge to work, as well as learn new skills and information, in order to grow a successful, healthy, and delicious crop! 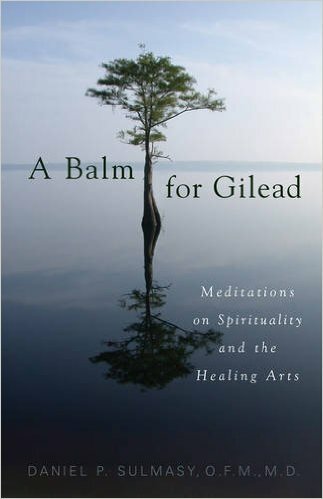 My mother-in-law gave me a book called, "A Balm for Gilead: Meditations on Spirituality and the Healing Arts," by Daniel P. Sulmasy. As I have read this work, a handful of ideas and prayers have struck me as quite profound and have stayed with me. I have always read this passage to mean that when we serve those who are on the outside, remember those who are forgotten, uplift those who are downtrodden, empower those who are oppressed, then we are caring for those who are close to Jesus' own heart. In this sense, when we love the "least of these," we are showing that our hearts are aligned with Jesus' heart, as well as serving those who are experiencing many of the trials Jesus himself experienced (poverty, rejection, etc.) And Jesus will remember these acts as evidence that the Holy Spirit was doing God's work of love and healing through us. "...So, although religious health care professionals may often want to understand themselves as 'channels' for God's healing power, Christianity teaches that they would perhaps be better served if they understood themselves first and foremost as persons privileged to serve God by serving the sick (p. 24)." For me, what seemed at first to be a subtle shift in perspective, upon further prayer and meditation, turned out to be earth shaking. When I look into the eyes of a person in the midst of physical or spiritual pain, can I see Jesus Christ himself? And if so, how will I encounter him, and what will he show me? How will I respond? While I still believe that God may use health care professionals as a conduit for his work and love in the world, I am also moved to think that upon my next encounter with human illness, if I look for it, I may see the glimmer of Christ incarnate. How that will change the way I look at a person! To learn more about how Jesus has shaped my drive to serve through public health, check out my post, "Jesus as a Community Organizer?"